RealPage is a comprehensive and efficient suite of property management software solutions used for streamlining the tasks related to managing rental property businesses that deal with different renters. Thus, the suite is ideal for rental property owners and teams that are handling commercial, affordable, student housing, senior living, military housing, single family, or vacation rental properties. The integrated and end-to-end web-based solution delivers an accounting system that helps rental property owners and staff simplify their financial processes and workflows, centralizing all their transactions and automating financial responsibilities. 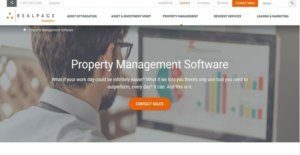 The property management solution also offers users the ability to perform accurate budgeting wherein manual data entry is eliminated and complex calculations are made easy. It has a robust and flexible document management tool that permits them to organize, search, publish, store, and secure electronic records of different types such as compliance documents, resident documents, financial statements, and training resources. RealPage is equipped with teams of compliance professionals that provide services so that property owners and managers are able to comply with federal, state, and local regulations. Last but not least, the suite of property management solutions gives users the capability to verify the credentials of vendors, letting them conduct background checks and vendor risk assessments and make sure that vendors are in line with the standards and requirements of their business. RealPage has a feature-rich property management accounting solution that enables property owners and staff to have full control over their financial processes and transactions. Eliminating manual and duplicate data entry, the accounting solution allows users to simplify how they perform back office accounting tasks. They will be able to sign documents electronically, conduct bank reconciliations, centralize disbursements, and access allocation tables. They can perform cash or accrual-based accounting, wherein all transactions are automatically posted on the general ledger in real time. The solution also has robust financial reporting capabilities. Users can view key metrics through a customizable dashboard, letting them gain insights into the financial performance of their operations. They will be able to track their cash flow, view trends in spending, and evaluate their budgeting. In addition, the accounting solution is built with a financial report writer which lets users create, modify, and customize financial reports. RealPage streamlines the process of preparing budgets for properties. Through the aid of its property management budgeting system, users can create a budget for each of their property accurately. When they make changes to their budget model, these changes will be updated and reflected in the entire system. Also, they no longer need to worry about complex calculations, as the system can handle all of those for them. The budgeting system of RealPage integrates seamlessly with its spend management solution. Thus, as users create invoices, make purchases, and manage vendor activities, RealPage automatically checks whether what they are generating and preparing complies with the budget they have assigned. They can determine if they are exceeding spending limits when they create orders for their properties. RealPage also provides users with the capability to ensure that their properties and business processes comply with government regulations, covering federal, state, and local regulations. Through the compliance services offered by its expert teams, property owners and managers can continuously verify if their move-in certifications and annual certifications adhere to housing programs. The compliance experts can also assess applications being submitted by potential tenants and residents as well as review move-in processes. In addition, the compliance services include on-site audits and property inspections which help users ensure maximum accessibility to their properties and optimize building systems for longer property life. RealPage has an enterprise-grade document and content management system which is designed for multifamily organizations. With such system, property owners, managers, and teams can keep electronic records of various types of documents such as corporate, property, and residential documents. The system offers an unlimited online storage that supports any existing disaster recovery plan or program. The web-based document and content management system enables users to quickly upload their forms, photos, and other documents by simply dragging and dropping them. Once the electronic documents are stored in the cloud, they will be able to easily access and retrieve any document they need. The system comes with classifiers and dataset values which they can customize, allowing them to browse and search documents in various ways. Also, as users share documents with stakeholders or publish them on third-party websites, the system encrypts them; helping users protect and secure their documents. They can even create roles wherein access to documents can be restricted based on the type of document or file being shared, the specific departments users belong to, and owners of the properties. Additionally, the system permits the setting up of customizable workflows so that documents that require approval are automatically routed to the right individuals. Summing it up, RealPage provides a vendor tracking and credentialing solution that allows users to check if the vendors they are dealing with have a good insurance and financial standing, don’t have criminal records, and are passing background checks. This way, they will be able to reduce costs associated with vendor risk and liability, guarantee that vendors are able to deliver an outstanding service. and make sure that they comply with the guidelines and requirements of their organization. If you are interested in RealPage it could also be sensible to investigate other subcategories of Best Property Management Software collected in our database of SaaS software reviews. Each enterprise has different requirements and needs a software that can be customized for their size, type of employees and clients, and the particular industry they are in. For these reasons, no software can proffer perfect functionality out-of-the-box. When you try to find a software system, first be sure what you want it for. Read some RealPage reviews and ask yourself do you need basic tools or do you need sophisticated features? Are there any industry-specific functionalities that you are seeking? Find the answers to these questions to aid your search. There are plenty of elements that you need to reflect on and these include your finances, particular business needs, your company size, integration needs etc. Take your time, try out a few free trials, and finally zero in on the platform that presents all that you want to enhance your firm effectiveness and productivity. How Much Does RealPage Cost? RealPage SMB and enterprise pricing plan information is available upon request. Contact the company’s sales department, and get your quote. We realize that when you make a decision to buy Property Management Software it’s important not only to see how experts evaluate it in their reviews, but also to find out if the real people and companies that buy it are actually satisfied with the product. That’s why we’ve created our behavior-based Customer Satisfaction Algorithm™ that gathers customer reviews, comments and RealPage reviews across a wide range of social media sites. The data is then presented in an easy to digest form showing how many people had positive and negative experience with RealPage. With that information at hand you should be equipped to make an informed buying decision that you won’t regret. What are RealPage pricing details? What integrations are available for RealPage? If you need more information about RealPage or you simply have a question let us know what you need and we’ll forward your request directly to the vendor.